Impressive in our ongoing, very successful Spanish music series, the BBC Philharmonic and its chief conductor, Juanjo Mena, also explores the works of the Argentinean composer Alberto Ginastera in three orchestral volumes. Not only acknowledged as a leading South-American composer of his day, Ginastera is also seen as one of the heroes of Latin-American music in general, whose enduring source of inspiration was Argentina itself: its pre-Columbian legacy on the one hand and the vast landscapes of the pampas on the other. 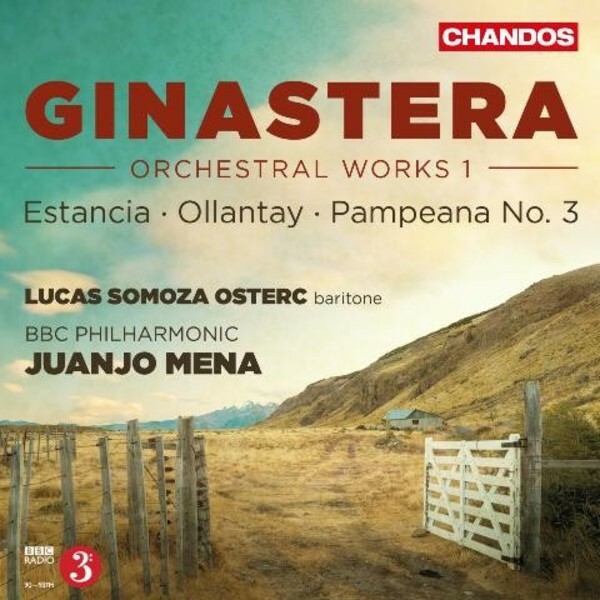 Indeed, if Ollantay is inspired by the former, and more especially by a dramatic poem of Inca origin, Ginastera turned to the latter for the setting of his second ballet, Estancia, based on the life of the gauchos who work in those wide open spaces. The essential genre of music in this piece is the malambo, an exclusively masculine, competitive traditional dance, far from the seductive tangos of Ginastera�s now more famous compatriot and pupil Astor Piazzolla. While the landscape is the same in Pampeana No.3, the music is more abstract and contrasted, marking the transition from what the composer called a compositional period of �objective nationalism� to a �subjective one�.